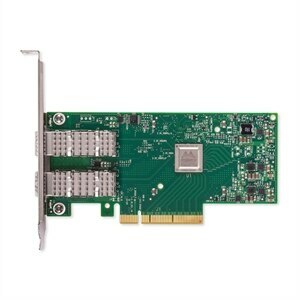 Mellanox ConnectX-4 Lx Dual Port 25GbE DA/SFP Network Adapter Gigabit Ethernet Network Interface Cards (NIC) deliver high bandwidth and industry leading connectivity for performance driven server and storage applications in Enterprise Data Centers, Web 2.0, High-Performance Computing, and Embedded environments. Mellanox Ethernet Adapters provide dedicated adapter resources that guarantee isolation and protection for virtual machines (VM) within the server. By enabling a single NIC to appear as multiple virtual NIC’s Mellanox Ethernet Adapters give data center managers better server utilization for LAN and SAN unification while reducing capital expenditures, power and cable complexity. New large-scale cloud environments require the implementation of overlay network protocols to overcome the issues of security, isolation and VLAN limitations within the cloud. Mellanox Ethernet Adapters bring a unique value to cloud providers by enabling them to reduce their CPU overhead and consequently reduce their OPEX and CAPEX by supporting more cloud tenants over the same infrastructure.